You probably already know that preventive dental care is crucial to keeping your teeth and gums healthy, not to mention beautiful. That is why you’re diligent about your dental hygiene at home. But if you’ve always wondered what more you could be doing to keep your smile in optimum shape, now is a great time to take some additional advice from your preventive dentist. Maintaining a healthy smile doesn’t have to be hard. It just takes a little consistent care! When it comes to your diet, you probably already know you should be limiting overt sweets, like cookies, cakes and ice cream. But many seemingly healthier options can also be high in sugar, which is known to contribute to cavities. So unless you’re buying fresh fruit or vegetables, which may have natural-occurring sugars but also provide much-needed nutrients, always read your labels. Try to limit any product with a form of sugar added to it, such as brown sugar, cane sugar or even corn syrup. Yogurts, granola bars, and many juices and sports drinks are laden with sugar, so check the label before filling your grocery cart. Many people think that if their teeth and gums appear healthy, there is really no reason to see the dentist every six months. 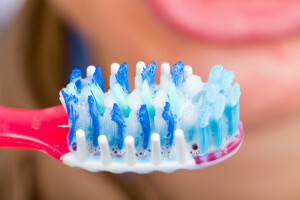 Unfortunately many dental symptoms are easy to overlook, and even seemingly esthetic issues, like plaque build up, can actually cause some very negative repercussions for your overall oral health. Calcified plaque bacteria, for instance, can lead to both cavities and gum disease, if not regularly removed through a professional cleaning. So don’t skip out on dental checkups if you value your smile’s health.